The king of drought-hit Swaziland has asked the government to build a palace for each of his 11 wives. The Times of Swaziland reports that King Mswati III asked for $15m - almost as much as the 2002 health budget. After years of failed rains, a quarter of the 1.1m population need food aid. Swaziland also has one of the world's highest rates of HIV infection - 33%. Two years ago, the normally docile parliament rejected his request to buy a $45m royal jet. 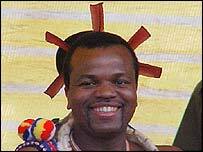 King Mswati reportedly wanted the money to redecorate his three existing palaces and build eight new ones. He chooses a new wife each year at the annual reed dance. In 2002 the mother of his latest bride took some of his aides to court, accusing them of abducting her daughter. He is Africa's last absolute monarch and political parties are banned.